“Building Readiness: America’s Army from the Great War to Multi-Domain Battle,” the theme of the Association of the United States Army’s 2017 Annual Meeting and Exposition, Oct. 9–11, will set the tone for speeches, industry and military exhibits, and special presentations from senior Defense Department and Army leaders. The Army-selected theme for the meeting recognizes that 2017 marks the 100th anniversary of the U.S. entry into World War I, which marked the birth of 41 U.S. Army divisions and made the U.S. a leading military power. It also recognizes the challenge for the future, symbolized by the Multi-Domain Battle operating concept that holds that future military power projection requires U.S. superiority across land, air, sea, space, cyberspace and the electromagnetic spectrum so adversaries cannot exploit capability gaps. The Army is testing this concept in training exercises. The AUSA meeting – A Professional Development Forum – will focus on panel discussions; Contemporary Military Forums; Military Family Forums; Homeland Security Breakout Sessions; and special multimedia presentations and educational workshops that reinforce, examine and showcase the Army, the soldier and the Army family. “This year’s three-day forum will emphasize AUSA’s important educational and professional role in supporting the warfighting and transforming Army – Regular Army, Army National Guard, U.S. Army Reserve – the men and women who serve, retirees, veterans, Army civilians, ROTC and U.S. Military Academy cadets, contractors – and all their families,” an AUSA spokesman said. 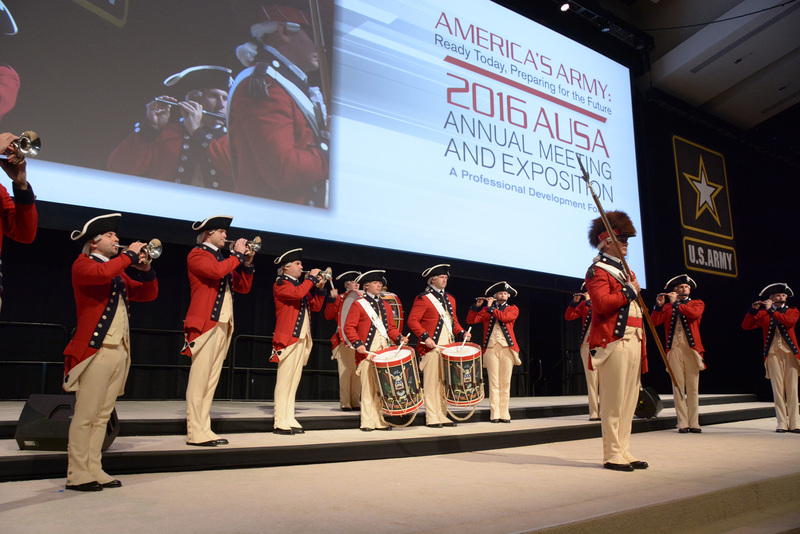 The AUSA meeting will again occupy the entire Walter E. Washington Convention Center as the Association celebrates its 15th year in the state-of-the-art facility. There will be over 600 displays in five halls located on both levels of the convention center, with over 250,000 net square feet of display space. There are 11 international pavilions: Australia, France, Germany, Greece, Israel, Korea, Norway, Poland, Switzerland, Ukraine and the United Kingdom. There will also be an AUSA Homeland Security Pavilion, two Small Business Pavilions and a Veterans Career Hiring Pavilion organized by the American Freedom Foundation. The Marriott Marquis DC Hotel, located directly across from the Convention Center, will be the meeting’s headquarters hotel. Ensuring the United States Army remains ready today while also preparing for the future requires a focused, sustained and collaborative effort across the Total Army. The effort combines the talents and missions of the institutional Army, the operating force, the joint community, academia and multinational partners. The Army Exhibit showcases the ideas and missions of its diverse force including those of Army components to the combatant commands. It will also showcase the Warriors Corner – a series of presentations on relevant topics from soldiers, civilians and leaders from the Total Army. AUSA is once again offering small businesses, including Association corporate members, an opportunity to showcase their products and services to over 26,000 attendees from around the world at two small business pavilions. To qualify, your company must be classified as a “small business,” as defined by the Small Business Administration. There will also be a Homeland Security Pavilion, a Department of Veterans Affairs Pavilion and an AUSA Veterans Pavilion. The Association of the United States Army has once again partnered with the American Freedom Foundation to host the Warriors To The Workforce Veterans Hiring Event, presented by GES, in conjunction with the Annual Meeting and Exposition. Held Oct. 9 to 11 at the Walter E. Washington Convention Center, the event is part of the American Freedom Foundation’s nationwide initiative to help veterans find jobs. The event brings together pre-selected transitioning military service members from the Military District of Washington for a day of transition workshops, symposiums and panel discussions and a day of one on one meetings with participating companies from throughout the country. On Wednesday, Oct. 11, Warriors To The Workforce will feature a networking and hiring event open to all veterans, military service members and military spouses throughout the National Capital Region. Attendance is free for veterans, military service members and military spouses. For more information on the pavilions, visit our website: http://ausameetings.org/2017annualmeeting or contact Lauren Hensley, AUSA’s exhibit manager, at (703) 907-2659 or [email protected]. Anyone may purchase tickets in advance online for lunches, dinners and receptions, and pre-register for the meeting by visiting the AUSA website at www.ausa.org. Also, tickets for lunches, dinners and receptions may be purchased on-site at the AUSA Ticket Pick-up area in the Convention Center from Oct. 6 to 11 if not sold out. There is no registration fee. Gen. Carter F. Ham, USA, Ret., AUSA president and CEO, will host the Chapter Presidents’ Dinner Sunday, Oct. 8, and will be the key note speaker at this event honoring AUSA’s volunteer leadership. On Monday morning, Oct. 9, members of the reserve components will attend the Maj. Gen. Robert G. Moorhead Guard and Reserve Breakfast. At this event, the Walter T. Kerwin Jr. awards to the outstanding Army National Guard and U.S. Army Reserve battalion-size units will be presented. The commanding general of U.S. Army Forces Command, Gen. Robert B. Abrams, will address the reserve component attendees. Following this breakfast, the meeting will officially open with a patriotic presentation by the 3rd U.S. Infantry Regiment (The Old Guard) and The United States Army Band, “Pershing’s Own,” in the center’s ballroom. The secretary of defense, James Mattis, is the keynote speaker. Three luncheons will follow the opening session. The U.S. Army Noncommissioned Officer and Soldier of the Year Recognition Luncheon is the venue where Sgt. Maj. of the Army Daniel Dailey will officially announce the Army Noncommissioned Officer of the Year and Soldier of the Year following the Best Warrior Competition held at Fort A. P. Hill. The Army vice chief of staff, Gen. James C. McConville, will speak at this luncheon. The commanding general, U.S. Army Materiel Command, Gen. Gustave F. Perna, will address the ROTC Luncheon for cadets and professor of military science personnel. AUSA also will host the Corporate Member Luncheon on Monday. The speaker is Gen. David G. Perkins, commanding general, U.S. Army Training and Doctrine Command. There will be a special reception for visiting international dignitaries, hosted Monday evening by the Association’s Industry Affairs Directorate. Monday’s activities conclude with the President’s Reception honoring the Army’s military and civilian leadership. On Tuesday, Oct. 10, the Association will host the Congressional Staffers Breakfast, where the secretary of the Army and the Army chief of staff, Gen. Mark Milley, will speak to the Hill staffers and Army guests before they tour the exhibit hall. At the Tuesday Dwight D. Eisenhower Luncheon, Milley will deliver his “State of the Army” address to the membership. At this event, the drill sergeants, recruiters and career counsellors of the year will receive awards. The Sustaining Member Luncheon that recognizes the Association’s defense industry members will be held on Wednesday. Speaker TBD. The Department of the Army Civilian Luncheon will also be held on Wednesday. Speaker TBD. Gary Sinise, actor and humanitarian who has focused on supporting service members, veterans, first responders and their families, will receive the Association’s highest award for selfless service to the nation, the George Catlett Marshall Medal, at the Marshall dinner on Wednesday night. He will also address the dinner, the Annual Meeting’s closing event. For up-to-date information and “Frequently Asked Questions (FAQs)” on the 2017 Annual Meeting and Exposition – A Professional Development Forum – go to the AUSA Annual Meeting website at http://ausameetings.org/2017annualmeeting.